This is a picture of a CT scan machine. The large square part in the back with the round opening is where the X-rays are generated around the patient. This is called the gantry and can be inclined at angles to allow for better visualisation of the tissues of the body. Modern scanners are called spiral CT scan machines and can currently take many images at a time. The table moves with an electric motor and allows the X-rays to pass over different tissues of the body as the patient passes through the gantry. CT scan machines generate a large amount of radiation and a CT scan should therefore only be performed for specific clinical indications. Computed tomography or CT scans have been with us for many years and are performed for many different disease entities. A CT scan is made up of ordinary X-rays (tomograms) that are fed into a computer (computed). They can be performed with a contrast medium (dye) that is injected into the patient’s veins. This contrast medium is usually iodine-based and circulates in the vascular system of the body. It is taken up in areas where there is increased blood flow such as areas of inflammation, infection or cancer. It is also used to examine patients’ arteries and veins. A CT scan is the best test to evaluate the integrity, alignment and pathology of the vertebrae of your spine. It is, however, not as effective when evaluating the softer tissues such as discs, ligaments and nerves. MRI scans are the best for evaluating softer tissues. 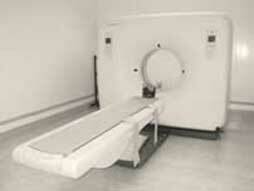 When undergoing a CT scan, you are placed in a large machine that is shaped like a doughnut. The table you are lying on will move forward and backward as the scan is being performed. Older-generation CT scanners could do only one slice (exposure) at a time; modern scanners do many cuts at the same time and are much faster.